Please scroll down for newer posts! Hello. I hope you all had a lovely Christmas day. Only 364 days until we do it all again! 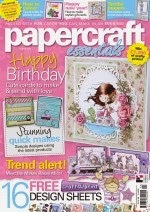 There is a new edition of Papercraft Essentials just out and I have a spare copy to giveaway (it's unopened and complete with free gift - I will also add some little bits and bobs). Leave a comment here and I will randomly pick a winner on Hogmanay (31st December). Hope you had a lovely day yesterday and not too stuffed with food and drink! Hugs Mrs A. Count me in!!! Would love to have this magazine - thank you for the chance. Happy Holidays to you, Liz! Hope you had a good Christmas. Great magazine, thanks for the opportunity to win! This would make a fab after-Christmas present. Thanks for the chance. Hope you had a lovely Christmas day. We had a lovely proper English Christmas dinner with some English and Dutch friends here on Crete. lovely thought, hope you had a great Christmas and wishing you a fun filled New Year ! I hope you had a wonderful Christmas Liz. Thank you for a chance to win a copy of the magazine, it looks like there are some wonderful articles inside. I hope that you enjoy the rest of the week. I hope you had a lovely Christmas Liz, thank you for the chance to win a copy of the new magazine. Hope you had a happy Christmas Liz and received some nice goodies. Thanks for the chance to win this magazine. Happy New Year to you and your family. Waves her hand hello!! I missed the drawing but I didn't miss the chance to tell you that I enjoy reading this blog and am looking forward to the 2014 posts! Have a safe one!